A mirror maintains identical copies of data on different devices. When data is written to one device, it is written to a second device as well, mirroring the data. This provides protection for device failures. When one leg of a mirror fails, the logical volume becomes a linear volume and can still be accessed. LVM supports mirrored volumes. When you create a mirrored logical volume, LVM ensures that data written to an underlying physical volume is mirrored onto a separate physical volume. With LVM, you can create mirrored logical volumes with multiple mirrors. An LVM mirror divides the device being copied into regions that are typically 512KB in size. 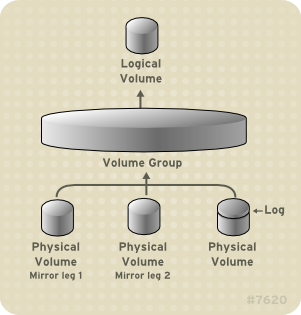 LVM maintains a small log which it uses to keep track of which regions are in sync with the mirror or mirrors. This log can be kept on disk, which will keep it persistent across reboots, or it can be maintained in memory. Figure 3.6, “Mirrored Logical Volume” shows a mirrored logical volume with one mirror. In this configuration, the log is maintained on disk. For information on creating and modifying mirrors, see Section 5.4.3, “Creating Mirrored Volumes”.